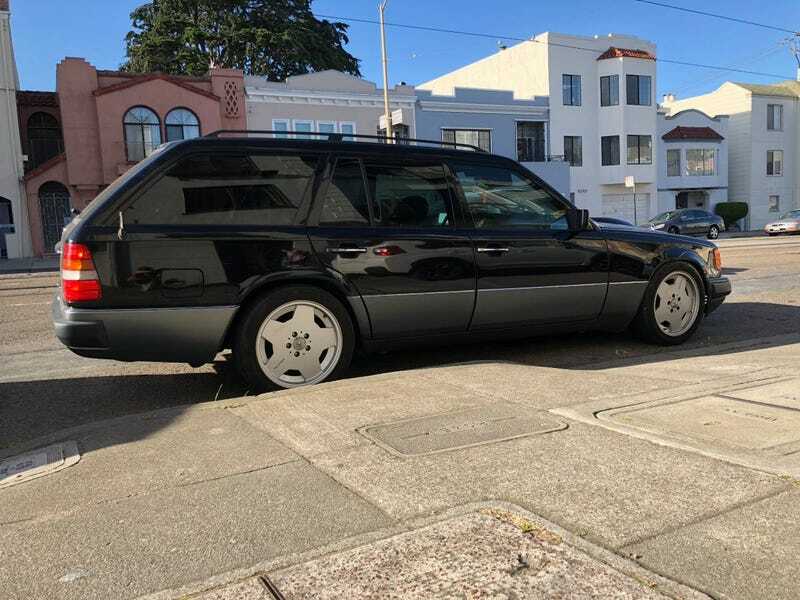 At $4,000, Could This 1992 Mercedes 300TE Be Your Long Term Longroof? Mercedes is a fine exemplar of the phrase ‘they don’t build ‘em like they used to.’ Today’s Nice Price or Crack Pipe 300TE is an example of the standard that’s no longer being met. Could its price build on that? Man, people are all about the ‘80s these days, what with Radwood fever sweeping the nation, and a political climate that makes us nostalgic for any damn-near other era. That fervor extended to yesterday’s 1982 Datsun 280ZX, which was in such nice shape that just looking at it made you feel you’d suddenly slipped into a long lost episode of Freaks and Geeks. Sadly for its seller, the $18,500 price tag proved much too this century, and the car fell in a 73-percent Crack Pipe loss. So then, what would be better than that retro sports car with a too-high price? Maybe something a decade or so newer, and with a much lower price would be more the ticket. This 1992 Mercedes Benz 300TE represents what is perhaps the best looking mid-sized wagon the German company has ever produced. Unencumbered by the brightwork of its W123 predecessor, this is also the last of the company’s E-class cars to be free of superfluous styling elements. Everything on the W124 feels purposeful and there for a reason. Adding to its appeal, this generation of E also has a reputation for longevity that is sorely lacking in its successors. Powering this longroof is Mercedes’ 103.980 3-litre straight six. That SOHCmill was good for 177 horsepower out of the gate along with 188 ft-lbs of torque. Mated to that is the company’s 722.4 four-speed automatic. This combination would give the wagon a solid 17 mpg. Yes, a diesel would do better, but then we’re not talking about diesels here now, are we? You do get the wonderful articulating single wiper meaning you’ll save on replacement blades so maybe it will all balance out in the end. The seller presents the car in his ad with some artistic photography, which, seeing as it’s being offered in funky San Francisco, of course he does. The black paint holds a shine and the expansive plastic trim on the bumpers and rockers appear free of any major damage. Wheels are AMG Monoblocks and honestly I’m deducting points here for those. Not for the car carrying the more modern wheels mind you, but for the seller including AMG in the ad title. The stock wheels come with the car, along with some other, undisclosed parts. Updates according to the ad, include Euro headlamps, which are a big improvement both functionally and aesthetically, 4-piston front brakes from a 400E, as well as shorter springs and Bilstein shocks in the front. The load-leveling rear struts are said to work without issue. The interior is all black with decent looking wood trim. An aftermarket stereo lives in the dash right below the somewhat cryptic HVAC controls, and looks to offer smart phone integration. The upholstery is amazingly intact, but then considering that it looks to be MBTex why wouldn’t it be? I think the black is a rare color for these cars but it looks classy AF here. Issues with the 175,000-mile car include an intermittent ABS light on the dash, minor leaks from both engine and transmission, and your typical city-dwelling car dings and chips here and there. Oh and and some point somebody painted the cam cover red. Yah-Hooo! Overall this appears to be a very tidy example of what’s arguably the last really great wagon Mercedes has built. The car, engine, and transmission all have the reputation for durability, and damn if it isn’t good looking. The question of course is what is all that worth? The asking price here is $4,000, a far cry from that of yesterday’s Datsun. And while this 300TE might not be as ostentatious as that 280ZX, it has a timeless quality that I think makes it a more rewarding long term choice. That’s just my opinion however. What we want of course, is yours. What do you think, is this 300TE worth that $4,000 asking? Or, does this longroof’s price short change your interest? San Francisco, CA Craigslist, or go here if the ad disappears. At $18,500, Could You T-Top This 1982 Datsun 280ZX?